Not your average potluck dish, but another all-time favorite for a homey comfort food, ya right you say? A dish that includes 40 cloves of garlic? Go figure and it is really the most luscious, sauce ridden chicken dish that I set out from time to time, that and The Silver Spoon Chicken Marbella, both winners, but this night, a cloudy rainy looking one was truly meant for this sweet chicken with roasted garlic dish and pretty much ready to plate in about an hour. I made it a two-pan dinner one for the chicken and one with lightly seasoned roasted tarragon asparagus. Of course, a warm loaf of bread is a must, after all, one needs to spread that lovely soft sweet garlic on something and then something needs to be used to sop up the gravy! Ina’s recipe is just one of many out there, but since it is time for one of our guest chef’s potluck I chose Ina’s version and slightly adapted it to add a bit more flavor by adding sprigs of fresh tarragon, I just love the combination of chicken and tarragon with the very mellow sweet and tender garlic. I prefer using a whole chicken cut into 8 pieces and like a chicken a little on the small side weight wise where many call for just chicken thighs and drumsticks. 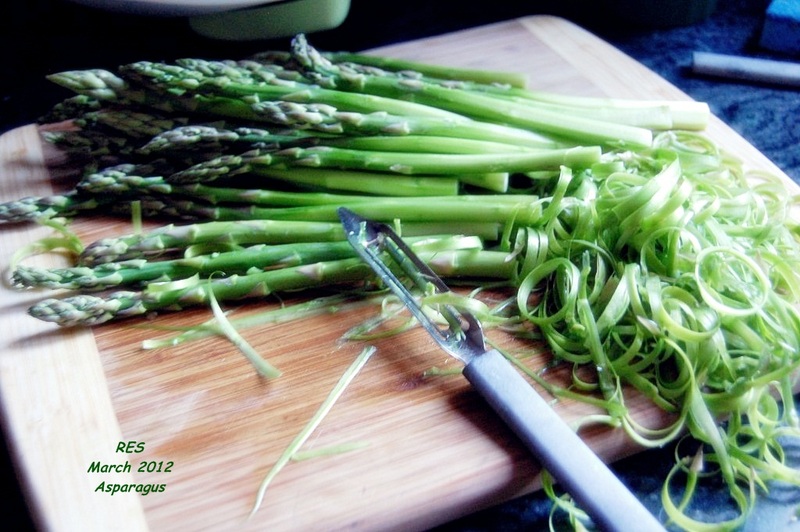 The asparagus was easy, trim and lightly season with EVOO, salt, pepper and sprigs of tarragon, roast at 375º for 8-10 minutes or until easily pierced with a fork or knife, but not roasted until mushy! If you like a little butter add a pat just before serving. Dry and season chicken pieces liberally with salt and pepper on both sides. Heat the butter and oil in a large pot or Dutch oven over medium-high heat. In batches, sauté the chicken in the fat, skin side down first, until nicely browned, about 3 to 5 minutes on each side. Turn with tongs or a spatula; you don’t want to pierce the skin with a fork. If the fat is burning, turn the heat down to medium. When a batch is done, transfer it to a plate and continue to sauté all the chicken in batches. Remove the last chicken to the plate and add all of the garlic to the pot. Lower the heat and sauté for 5 to 10 minutes, turning often, until evenly browned. Add 2 tablespoons of the Cognac and the wine, return to a boil, and scrape the brown bits from the bottom of the pan. 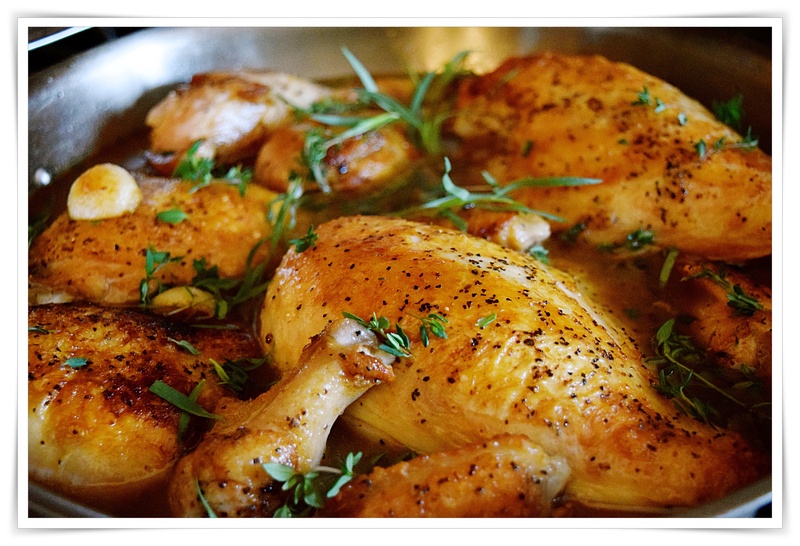 Return the chicken to the pot with the juices and sprinkle with the thyme leaves and tarragon sprigs if using. Cover and simmer over the lowest heat for about 30 minutes, until all the chicken is done. Remove the chicken to a platter and cover with aluminum foil to keep warm. In a small bowl, whisk together 1⁄2 cup of the sauce and the flour and then whisk it back into the sauce in the pot. Raise the heat, add the remaining tablespoon of Cognac and the cream, and boil for 3 minutes. Add salt and pepper to taste; it should be very flavorful because chicken tends to be bland.